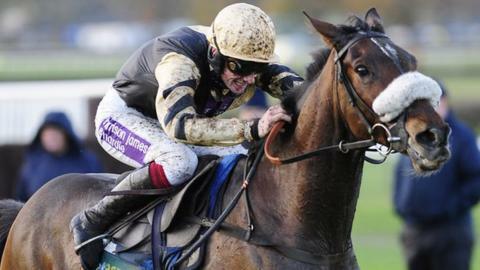 Jockey Sam Twiston-Davies believes his mount Tidal Bay can defy the statistics and make history by winning the Grand National at Aintree on Saturday. No top weight has triumphed since Red Rum in the 1970s, while no horse older than 12 has won the famous steeplechase since Sergeant Murphy in 1923. But Twiston-Davies believes the Paul Nicholls-trained bay gelding is out of the ordinary. "Tidal Bay is no normal 13-year-old," Twiston-Davies, 21, told BBC Sport. "Not many 13-year-olds will be carrying form like his into the race." Many top chasers are retired by the age of 12, but Tidal Bay has been third in the Welsh National and second in the Irish Hennessy Gold Cup this season. Seven-times champion trainer Nicholls, who won the National at Aintree in 2012 with Neptune Collonges, has indicated Tidal Bay could stay in training for another season or two. Referring to the National statistics, Twiston-Davies said: "It wouldn't worry me at all. "His form is very solid. He was second in an English Hennessy, then an Irish one. His Lexus win [Leopardstown, December 2012] was an amazing feat, and if anything the handicapper has given him a bit of a chance." The National is a handicap chase with horses allotted different weights according to their ability. While Tidal Bay will have the biggest burden, 11st 10lb, in the line-up, the mark is 7lb lower than his official rating. "I schooled him on Thursday. He seems in really good heart. To sit on him, you wouldn't believe he was 13," said his big-race jockey, who had just turned 14 himself when Tidal Bay won his first race back in October 2006. Twiston-Davies is a name inextricably linked with the Grand National. Sam's Welsh father Nigel is the only current trainer to have saddled two winners of the big race - Earth Summit (1998) and Bindaree (2002). Sam sat on both of them when they returned to the family's Gloucestershire stable, and said he owes much of his success to Bindaree, whose National victory changed Nigel's mind about quitting the sport. "My career's been made by Bindaree winning because I wouldn't be riding half as much if it wasn't for him," said Sam. The rider has been tipped as a potential successor to 18-time champion jump jockey AP McCoy in a few years when the Northern Irishman retires. He boasts a maturity beyond his years and has been appointed as an ambassador for Aintree racecourse, but said winning the National would seal a childhood ambition. "It would be a dream come true - one of those moments you think of as a kid but never really think it could happen," he said. "To ride in the race is magical. Hopefully I'll have a good ride and all the jockeys and horses come back safe." Asked to nominate the biggest dangers to his chances, Twiston-Davies said: "Teaforthree is favourite and I loved the way he jumps and travelled last year before tiring late on [finished third]. "It's a very, very competitive handicap, and very open. You could make cases for a lot of them. Honestly, I'm really happy with my fella."